A Swedish politician has caused outrage by saying that halal meat has magical powers and can turn you into a Muslim. The nationalist Sweden Democrat, which has around 20 percent support amongst the population, also wants to ban halal meat in schools. Michael Ohman, the head of the nationalist party’s Heby wing told the Sala Allehanda newspaper that, “You become a Muslim if you eat halal meat,” the Local cited him as saying. Ohman, who is a member of the Swedish Democrats from the small town of Heby, which is 115 kilometers northwest of the capital Stockholm, also mentioned he wants to see halal meat outlawed in local schools because he believes it is against the country’s animal welfare laws. 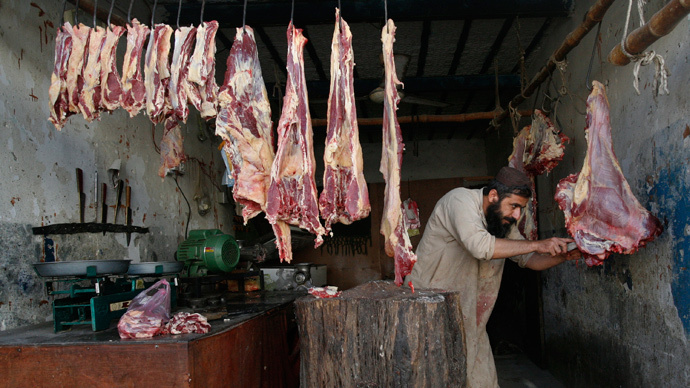 Traditional methods of producing halal meat involve slitting an animal’s throat to ensure the spinal cord isn’t damaged. However, a Swedish political scientist told RT that the move to condemn halal practices is unlikely to garner widespread support, as the majority of the population “generally support plurality,” and there is a widespread acceptance of Muslim values. “This is a very light way of saying that we do not want Muslims in this country, which is of course widespread Islamophobia,” Groglopo told RT. “This is ridiculous saying that halal meat is a kind of magic and you will become a Muslim if you eat it. It is just ridiculous. There is no other word for that. They are starting to terrorize Muslim’s politically,” he added. @MartinAagaard Vad händer om man blandar halal- och kosher-kött? Vilken magi är starkast? Another user poked fun at the politician’s comments by saying, “If only you knew how magical halal meat is. How do you think that Aladdin could fly on a carpet? “A Swedish Democrat politician in Heby (Uppsala) has found that halal meat has a magical influence to make children into Muslims. Quite right. He has solved the mystery,” said another user. SD-politiker i Heby (Uppsala) tycker att halalkött har en magisk påverkan att kunna göra barn till muslimer. Helt rätt. Han har löst gåtan. It is unlikely that the Swedish authorities will be adhering to Ohman’s request to ban halal meat in the country’s schools any time soon, with one expert saying the practice is perfectly safe if carried out properly. “Swedish halal slaughter meets the same requirements as other slaughter [in Sweden]. We don't care about religion, only animal protection,” Shivar Magdal, veterinary inspector at the Board of Agriculture, told Sala Allehanda. There were also no religious grounds to ban halal said a legal expert. “The school should be non-denominational, that is no confessions of faith or prayers. Eating halal meat is not a confession of faith,” School Inspectorate lawyer Sofia Wirlee told the Swedish publication, as cited by the Local.